I felt the title should be capitalised, as if to shout royalty’s name. For this could be a palace. A staggering four-storeys high, this white-walled cake-castle has more lights than a town square Christmas tree (you can see a photo at night here). 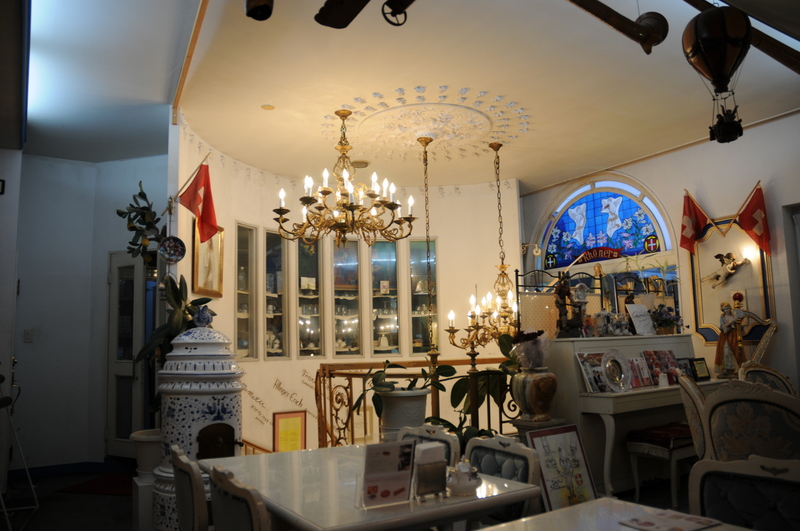 The palace is actually a café. 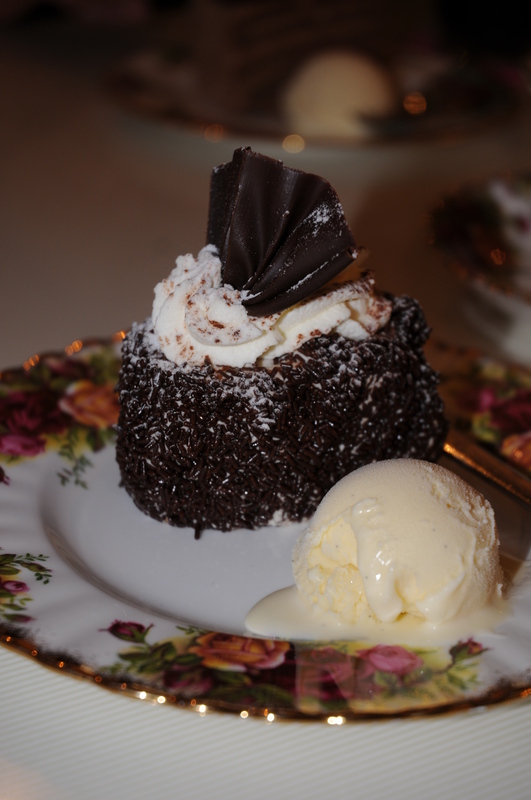 And when we saw it, we were hooked: we absolutely had to eat cake there. 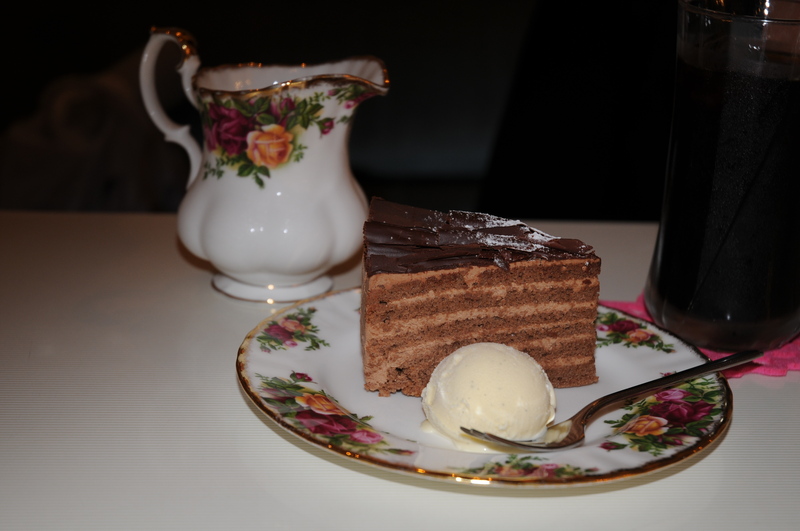 When we saw that a cake and coffee set was only 650円, we returned post haste. As this is a food blog, I should probably start with the food. 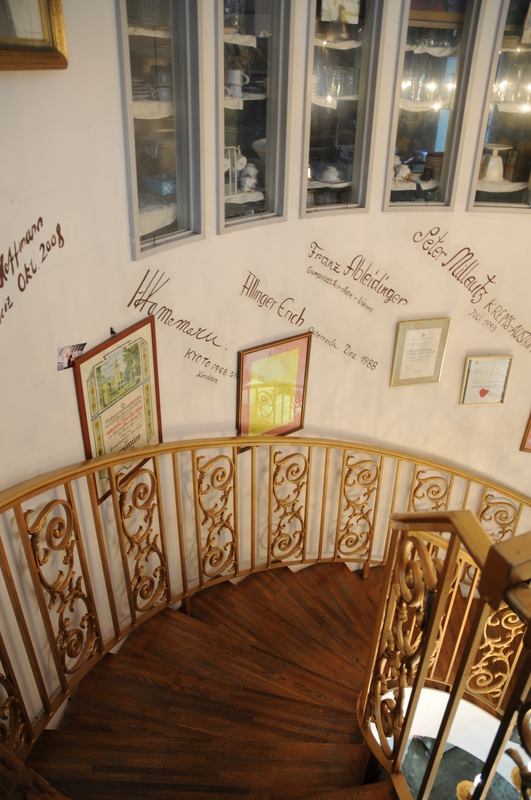 But for once in my life, I was more taken with the interior of a café than the menu. The owner was inspired by European architecture and style, particularly Germany, Austria and Switzerland, and collected artefacts accordingly. Here are some photos so you can the idea of the wooden planes, hot air balloons, cherubs, rocking horses etc. Now it wasn’t too long before our cakes and coffees arrived. I chose chocolate cake and Calle chose cherry chocolate cake. Both came on beautifully old-fashioned ornate tea crockery. I went straight for the home-made vanilla ice-cream which had the lightest of flavours and was an absolute delight. Sadly, “light” flavours aren’t always a good thing and when it comes to chocolate cake, I want HEAVY chocolate flavour. My cake just merged into a mush of sponge and cream in my mouth. It was almost like eating air – not enough substance. Calle’s cherry cake suffered from a similar affliction – it was fantastic when you came across a cherry, but without, it just evaporated. It wasn’t unpleasant – it just didn’t touch the sides of a cake craving. It left me wanting more – it left me wanting stodgyness. Visit for the fantastic décor and an amazing value cake set. Food quality 2.5/5 – The cakes were of good quality but they lacked taste. The home-made ice cream saved it. 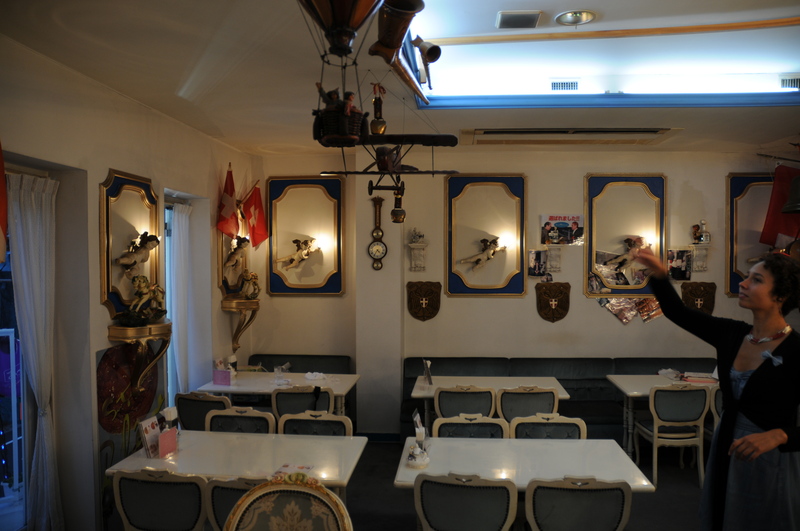 Atmosphere 4/5 – Although the shop was well-frequented, we were the only people in the café. It didn’t matter when we had two little men popped out a clock to announce 5pm. In essence, the ornaments will keep you company. Service 4/5 – Prompt service plus a brief explanation about the history of the place. As you come out of Yamashina JR station, walk down towards the main road. Just before the giant Racto department store building, turn right. 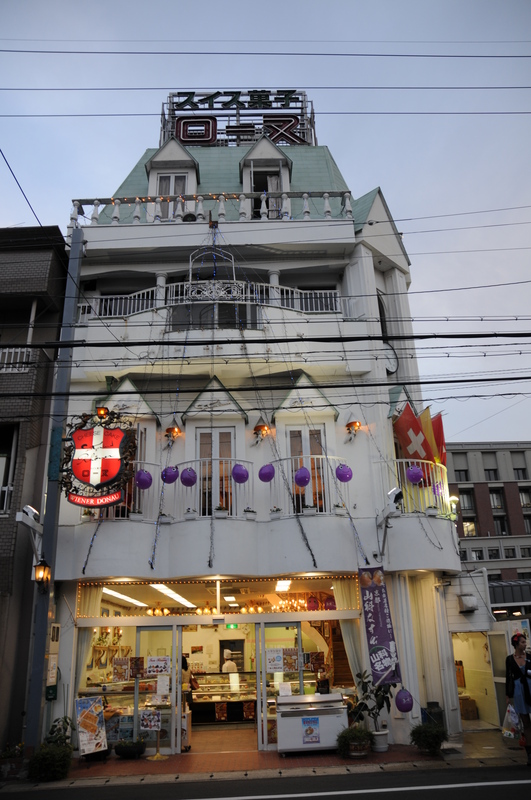 You will be on a small road which runs parallel to the main road, Sanjo Dori. Carry on walking straight for about 10 minutes. The cake palace will be on your left. You can’t miss it. Final note: Why are there purple smiley faces hanging from the outside? That doesn’t look very European – it looks more Japanese. Well done, careful observer. You’re absolutely right. Those aren’t purple smiley balloons or plums as I assumed. It’s the Yamashina-ku Aubergine Festival! And every shop is covered in them. One even found its way upstairs into the café….